The Topre Realforce105UB keyboard, exclusively produced for The Keyboard Company in full 105 key United Kingdom layout, is a joy to type on. It incorporates Topre's patented 30 million key life cycle non-contact electrostatic capacitance switches with a switch weight of 45g. The light gold on black keycaps with their tactile feel and N Key Rollover ensure fast and accurate input. A first-rate product. You can tell from the length of other reviews how much pleasure it gives in typing! Like a top-class piano, it has a consistency and understated quality that can only have come from years of patient development based on the unshakeable foundation of the IBM keyboard. It's absurd to suggest that it is expensive. It would be better to say that its competitors are cheap. At a fraction of the cost of a serious computer installation, to say nothing of the cost of software, the cost is relatively insignificant. A quality keyboard will last many years, and this underscores the value for money. The only request I would have is for cleaning instructions. I visited The Keyboard Company in Stroud as I was unable to decide whether the Topre keys were going to be to my liking. I spent most of the day there and they couldnt have made me feel more welcome. They even gave me lunch! After many hours comparing the Cherry MX Blues of the Filco Majestouch with the Topre Realforce, I decided that the Topre keys were for me. A few months on, I continue to enjoy typing on this keyboard. The quality is outstanding. The keys register every keystroke with the satisfying thock that Id read about online, but didnt really appreciate until I owned one. The keyboard works seamlessly through my KVM switch and after many hours of typing, my fingers are never tired. Ultimately whether youd prefer the exciting click of the Cherry MX Blue switch or the understated thock of the Topre is for you to decide. Yes this keyboard is expensive, but if you spend many hours of your day using it, dont you deserve the best? 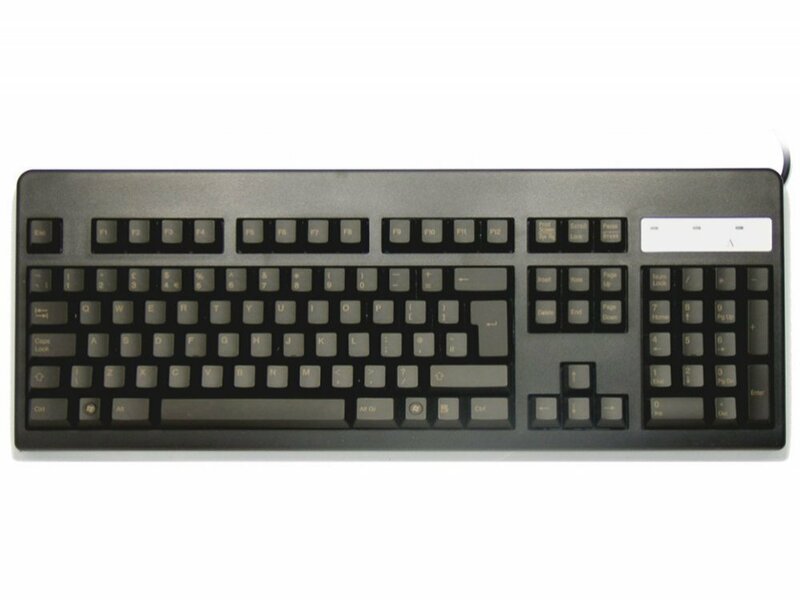 I own and work with 9 different keyboards, 8 of them are mechanical; Model M (IBM and Unicomp), Das Keyboard (blue Cherry MX), Cherry MX Board 6.0 (red Cherry MX), Matias Tactile Pro 4, Logitech G710+ (brown Cherry MX), Topre RealForce (Hi-Pro) and this keyboard, the Topre RealForce in UK lay-out. My Logitech keyboard is my workhorse, it can handle everything you throw at it; typing, programming, gaming and so on. Buckling spring and blue Cherry MX switches are a tad too heavy for me, the Tactile Pro 4 is only good at making noise, the Cherry MX Board 6.0 is a close favourite but doesn't match the experience provided by the RealForce. The very first thing that came to me when I typed on this keyboard is how nothing else compares to it. Whenever I want to do serious typing I always switch to one of my Topre keyboards. Void of embellishments (no multi-media keys and backlight for example) and non-clicky, each key-stroke gives a pleasant soft thock sound I came to value. The key-cap material, with gold print for this UK version, seems also unique to the RealForce, its slightly rough of texture which prevents finger slips. Granted, the Topre switch is not a true mechanical switch but a hybrid construction between a mechanical and a rubber dome switch, which makes no difference to me. I have no doubt that this keyboard is made to endure a long time of typing, something it needs to justify its high price tag, for this is indeed the second most expensive mechanical keyboard I own (the most expensive one being the Hi-Pro version). It comes down to personal taste rather than hard numbers and graphics when choosing between what mechanical switch is better and you'll find avid fans of every switch type. The only drawback is the severe limited availability of this keyboard, so should you be in the marker for one, be prepared to do some searching before finding the one you want. Another drawback, one of the smallest degree, is how the left side of the keyboard moves too easily over my desk, which is easy to solve. Delivering this keyboard proved troublesome, I gave the wrong address, but thanks to the excellent cooperation from the Keyboard Company I eventually got it, they even refunded the shipping cost. First thing first - admittedly this is one of the most expensive keyboards you are likely to find. And yet I believe it deserves the price demanded. Before this keyboard I owned a series of keyboards with Cherry MX switches - both blue and brown (various brands - Das Keyboard first, then Filco and WASD). These are good keyboards, if somewhat harsh. Topre, on the other hand, is a sublime keyboard - the keys move gently, but confidently and definite although quiet snap. It has just the right amount of key travel, and it is very quiet compared to all other mechanical keyboards. Typing on this keyboard is a luxury, I would even call it a Rolls Royce among keyboards. Also the keycaps are extremely hard-wearing, of all the keyboards I owned only recently bought WASD seem to maintain labels so well. I was so enamored with it that after buying the first one for my desk in office, I bought second but smaller model for home. This unfortunately turned out to be a bad choice, for no fault of Topre - it is simply difficult to keep switching between full 105-keys midday and tenkeyless model in the evening, as the hand keeps wandering to the wrong position when moving from mouse. Also it turns out that the tenkeys keypad is actually useful for calculations. Eventually I've put away small Topre on the shelf and switched to WASD at home, while continuing to use large Topre in the office, and went looking to buy another large Topre for home. This unfortunately uncovered one fault of these keyboards: they are extremely difficult to buy in UK layout. I recommend that as soon as you see them on stock, give them a try while they are available. Your fingers and wrists will appreciate it.